An important defining characteristic of TCP/IP services is that they primarily operate in the client/server structural model. This term refers to a system where a relatively small number of (usually powerful) server machines is dedicated to providing services to a much larger number of client hosts; I describe the concept more in the topic on network structural models in the networking fundamentals chapter. Just as client/server networking applies to hardware, this same concept can be applied to software and protocols, and this is exactly what was done in the design of TCP/IP protocols and applications. TCP/IP protocols are not set up so that two machines that want to communicate use identical software. Instead, a conscious decision was made to make communication function using matched, complementary pairs of client and server software. The client initiates communication by sending a request to a server for data or other information. The server then responds with a reply to the client, giving the client what it requested, or else an alternative response such as an error message or information about where else it might find the data. Most (but not all) TCP/IP functions work in this manner, which is illustrated in Figure 19. Most TCP/IP protocols involve communication between two devices, but the two rarely act as peers in the communication; one acts as the client and the other as the server. This simplified illustration shows a common examplea World Wide Web transaction using the Hypertext Transfer Protocol (HTTP). The Web browser is an HTTP client and initiates the communication with a request for a file or other resource sent over the Internet to a Web site, which is an HTTP server. The server then responds to the client with the information requested. Servers will generally respond to many clients simultaneously. 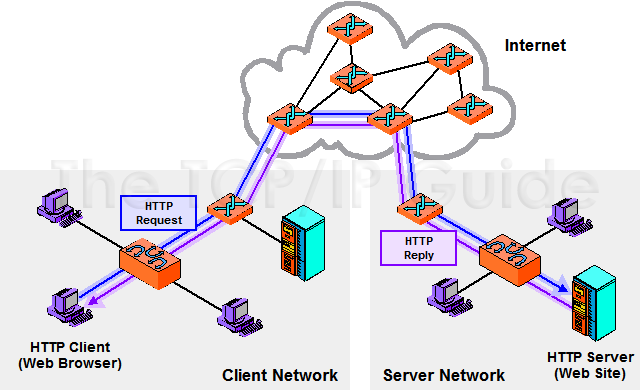 There are numerous advantages to client/server operation in TCP/IP. Just as client hardware and server hardware can be tailored to their very different jobs, client software and the server software can also be optimized to perform their jobs as efficiently as possible. Let's take again the WWW as another example. To get information from the Web, a Web client software (usually called a browser) sends requests to a Web server. The Web server then responds with the requested content. (There's more to it than that, of course, but that's how it appears to the user.) The Web browser is created to provide the interface to the user and to talk to Web servers; the Web server software is very different, generally consisting only of high-powered software that receives and responds to requests. Key Concept: The TCP/IP protocol suite is strongly oriented around the notion of client/server network communication. Rather than all devices and protocol software elements being designed as peers, they are constructed as matched sets. Clients normally initiate communications by sending requests, and servers respond to such requests, providing the client with the desired data or an informative reply.